Maggie Muggins Designs: What Do You Think? So recently my Mom asked me if I knew anything about the current trend: Blackboard Vinyl, and how it works. Let's just say I've seen the item all over in the Blog world lately. I think it's absolutely adorable and seriously for about 5 minutes almost bought some for my house. (That was the first time I saw it.) Then, however, I got to seriously thinking about it. Thank Heaven. Sure it is really cheap and cute. It's not only a decoration, but it has practical use. BUT, when it all boils down I HATE CHALK. 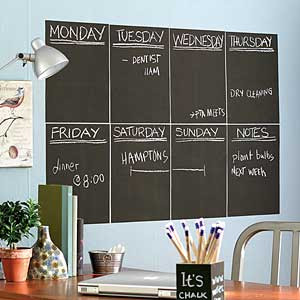 Why then, would I ever want a blackboard in my home? In Elementary School we all took turns cleaning the chalkboard brushes. (Yes, when I went to school there were still blackboards.) So maybe that's why, or was it the sound of scratching nails on a blackboard that I associated with chalk? If you ever write on a cardboard box with a Sharpie it's pretty much the same sound as chalk on a blackboard. I did for a job. That just brings back memories of boredom. Then again, I don't know if that sound would even exist with the vinyl. Anybody out there know? But even more than all that. I just don't like the texture of chalk in my hands. It makes my skin crawl to think about it. I'm still wondering what crazy idea caused me to buy my son sidewalk chalk. I suppose this should be a confession, but no, it's merely an explanation. I'm so glad I thought that purchase through. Although, I suppose this one I could have given it to my Mom as a gift. Unless reading this is making her reconsider as well. Overall - for looks I must say I approve. Adorable. But for practicality at my house it scores really low. As to the how it all works? It's really easy to put up and install just like all the Vinyl Lettering things out there. Just remember, the larger the piece you get, the more difficult it will be to align perfectly. Of course, considering the textured finish it will be thicker than the vinyl used for lettering. But it's still going to be a lot thinner than actually buying the blackboard. If you do end up buying this product I sincerely hope you enjoy it. I'll be sticking with my Whiteboard and Dry Erase Markers. Thanks. Actually, one of these days I'll show you our own little system. i'd not ever seen this before. it is cute, but i think it would have to really work for someone's space. 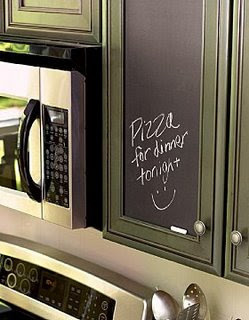 sounds like an inevitable mess with lots of chalk dust, unless the vinyl is a lot cleaner than an old-fashioned board. i don't know... would be interesting to find out. Oh What do you do in the Daytime?